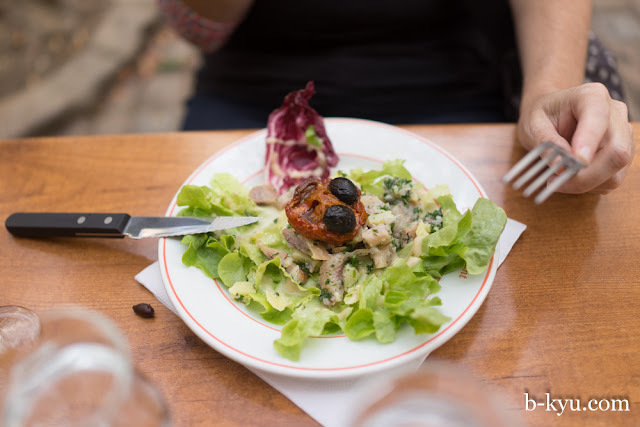 With only a couple of days in Lyon we barely scraped the surface of what the food capital of France has to offer. But we gave it a good cracking go. During our month in Paris we only went outside the capital once, jumping on a high speed train to stay in Lyon for two nights. 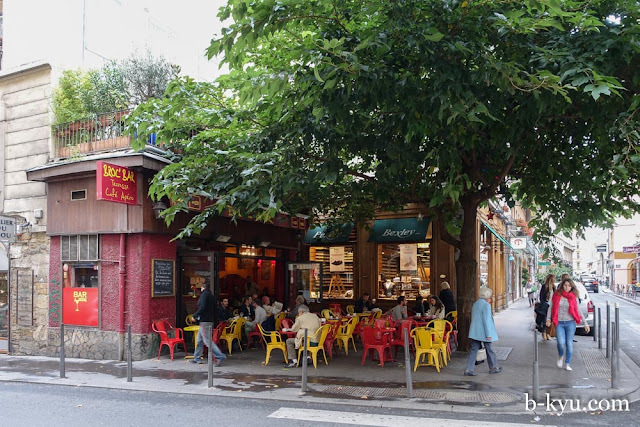 We'd read about the bouchons, dreamed about the sausages, but generally didn't really know what to expect. We didn't have too many opportunities to eat out, but what we did eat made us plan for a longer return stay, one day. Catching a train from the Gare de Lyon in Paris early on a Monday morning was a fascinating insight into the French train system. The biggest part of the wait was the lottery like surprise of which platform the train might leave on, causing everyone to hover around a big station notice board until their platform is revealed then rush frantically to board. We bought some fresh baguettes from this station snackeree so we could polish off our leftover cheese, terrine and pate picnic style on the train. Overall the cakes looked as average in quality as most transport eateries, but the baguettes were fresh out of the oven. Travelling on trains opens your eyes to new sights along the way. 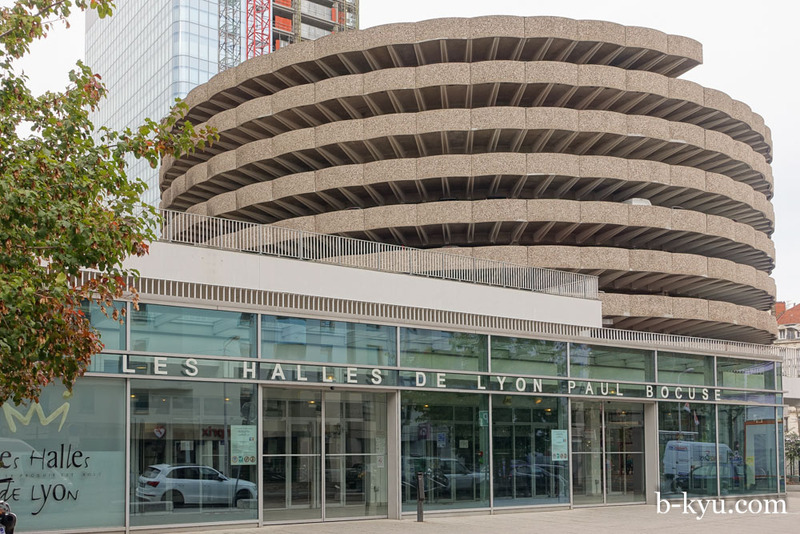 Getting into Lyon one of the first places we went to was the the Les Halles de Lyon Paul Bocuse markets, located a short walk or tram ride from the Part-Dieu train station. The car park behind is a modernist architectural wonder that gave the otherwise low, flat and mostly unspectacular market building a spark of interest. It reminds us of the MLC Centre in Sydney. Of course, it's what's inside that truly counts. 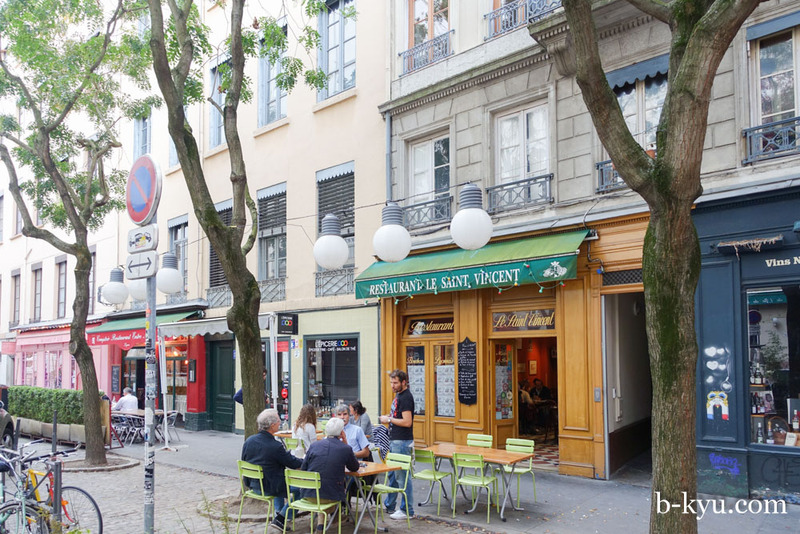 Our stay in Lyon was mostly going to be self catering rather than eating out, so this place was an essential first stop to stock up on produce, ready made goodies and of course, cheese and saucisson. Aaaah, but as can be the lot of the traveller, most of the market seemed closed, including the famous Chacuterie Sibilia. We had spied the must-visit store on the SBS series French Food Safari and we were disappointed when it was closed when we visited. It turns out that although the market itself is advertised as open, not all the stalls follow the same opening hours. Thursday, Friday and Saturday seem to be the best days to visit. Some of the stalls also closed for lunch, especially on a weekday and some shut down for annual holidays. Apparently the market is at it's best first thing in the morning, unlike Shawn most days. 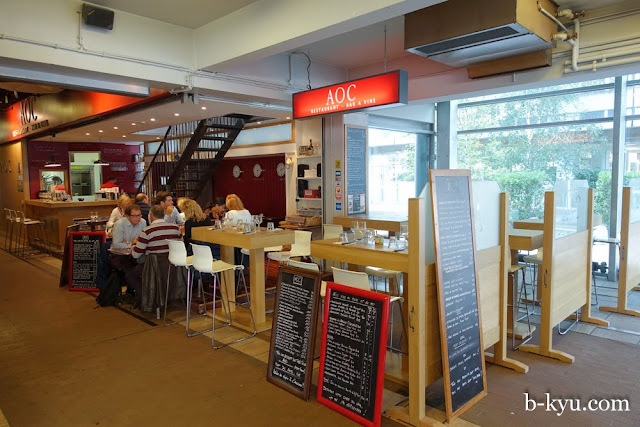 Our disappointment led us to stop for lunch to recover at AOC Wine Bar, located inside the market, at least some of the restaurants were open. Starters was an organic amber French beer. Some disappointment starts to fade. Tart a la Tomate, very ripe and sweet tomatoes on a tarte tartin like base, served with a splodge of soft goats cheese (10€). 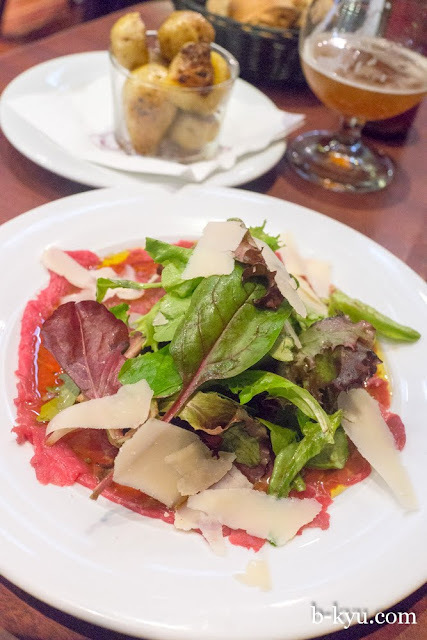 A beef carpaccio with Aubrac beef (an old French cattle breed), salad and shaved parmesan loaded on top, 16€. 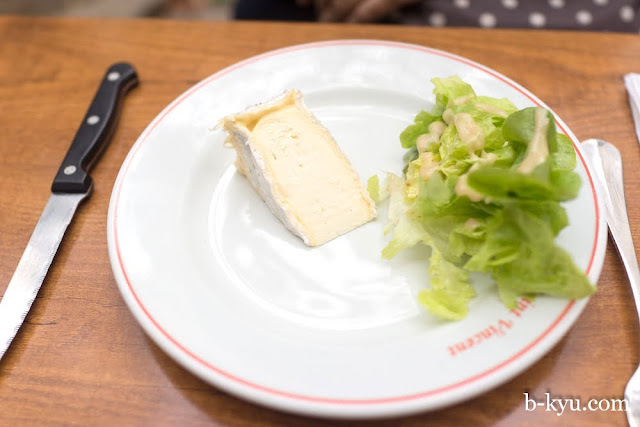 This was a choice way to enjoy the beef, mixing through the salad leaves, cheese and olive oil into one forkful. In the background a serve of baked new potatoes, stealing and fighting ensued for every last one. ...and often stopping for a quick espresso hit in small outside coffee bars to keep going. Our lunch opportunity presented itself when we wound up back in the first arrondissement. Walking through a small closed off street with a number of good looking places to eat, Restaurant Le Saint Vincent was our pick of the bunch. 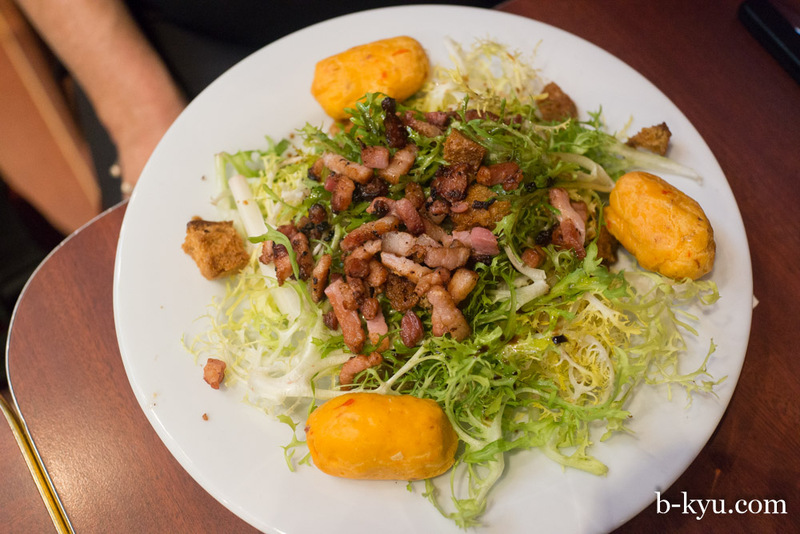 Every Lyonnaise bouchon requires a waiter in traditional Iron Maiden shirt, further sealing the deal for us. 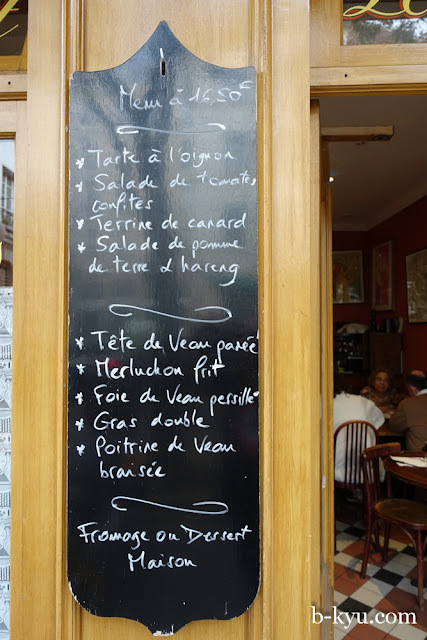 Set price lunch menu for 16.50€ makes the choice easy. Choosing is more difficult, we pulled out our trusty French food translation guide and quizzed the English speaking waiter for help. We divvied up the menu so we could try as much as possible. For starters, salade de pomme de terre au hareng - pickled herring with potato and a semi dried tomato with halved olives on top. 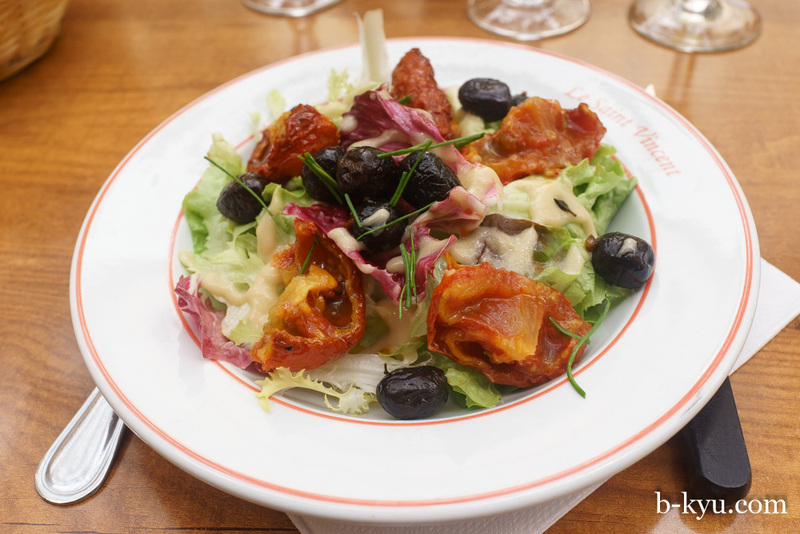 Salade de tomates confites, semi dried tomatoes in olive oil with olives and a light dressing. Foie de veau persille - calf liver with garlic and parsley. Too offaly for Shawn but a magic food moment for Al. 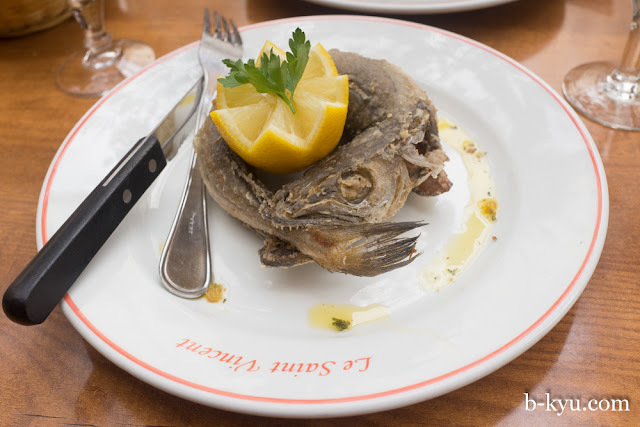 Merluchon frit - deep fried hake, a very plain tasting fish dressed up with fresh lemon. We loved the presentation of the fish, like a dog biting his tail. 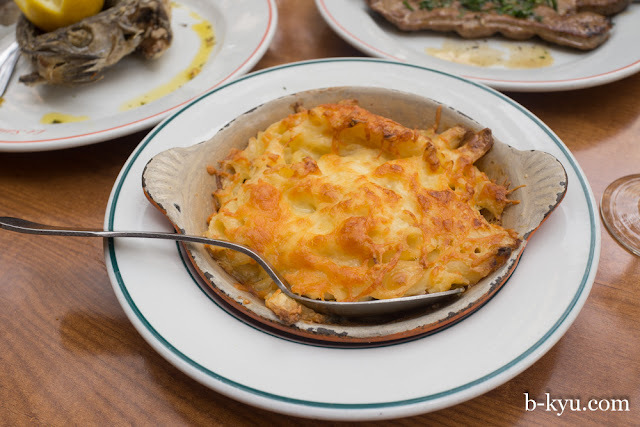 Side dish of macaroni and cheese to share, magnifique! For dessert we split the fromage plate, a beautiful piece of soft cheese and dressed lettuce. 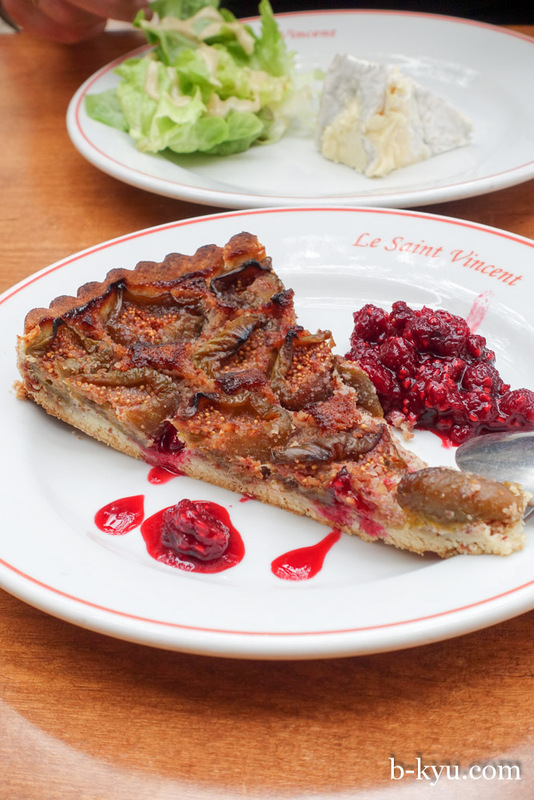 Harder to share is the house dessert, a fig tart with berry conserve. 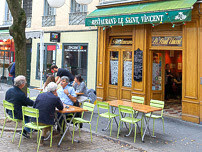 Restaurant Le Saint Vincent is at 6 place Fernand Rey in the 1st, there's seating inside and outside. Luckily for us we were able to head back to the market again and more stalls were open. We stocked up on a few bits for supper. 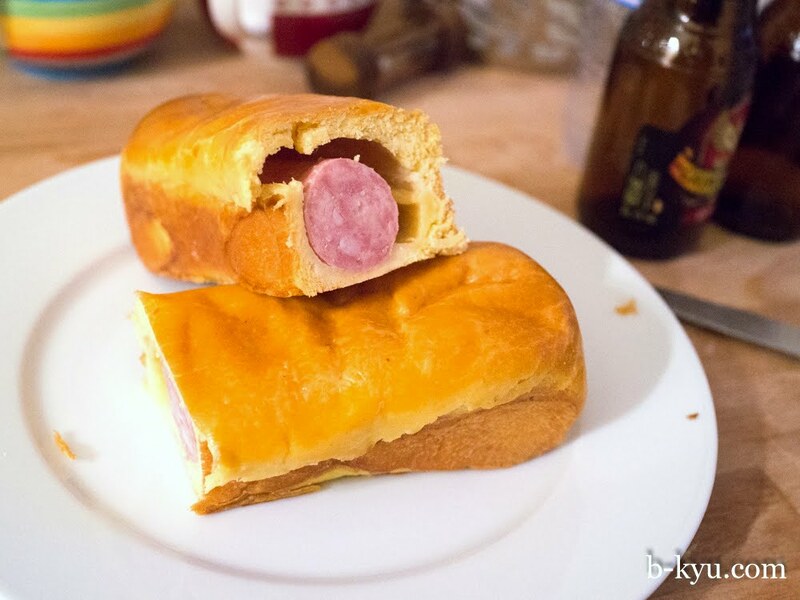 A small version of the classic saucisson en brioche, a Lyonnaise sausage encased in a brioche bread house. Just a fancy sausage roll really. While we're not so much enamoured of this sweet bread used with hamburgers, it worked with the sausage. We picked up another of these to take back to Paris. The Cellerier cheese stall was magnificent, an extravaganza with cheese at different stages of ripeness. 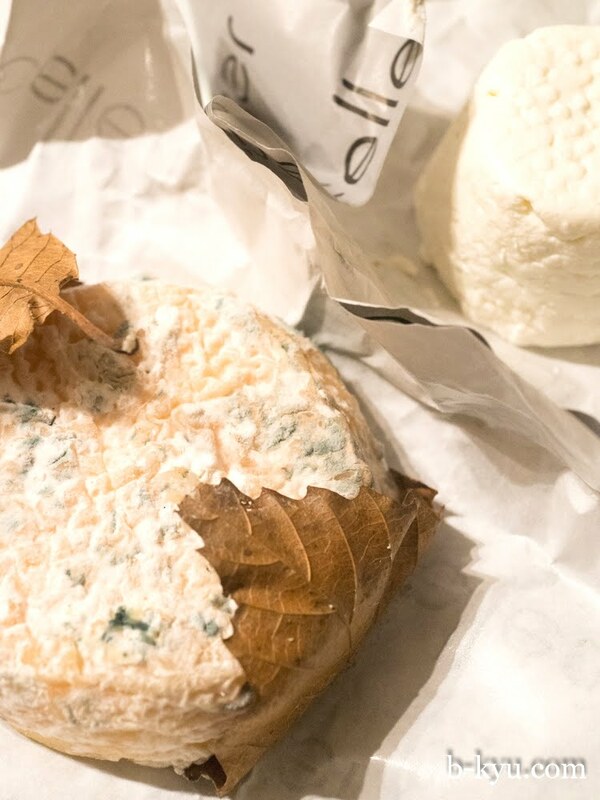 The cheesemonger selects the perfect piece for you, asking when you want to eat it so he can find the right level of ripeness. We chose some raw goats milk cheeses and a couple of packets of Beurre Bourdin, the creamiest version of butter as well as one with extra salt, for later indulgence. 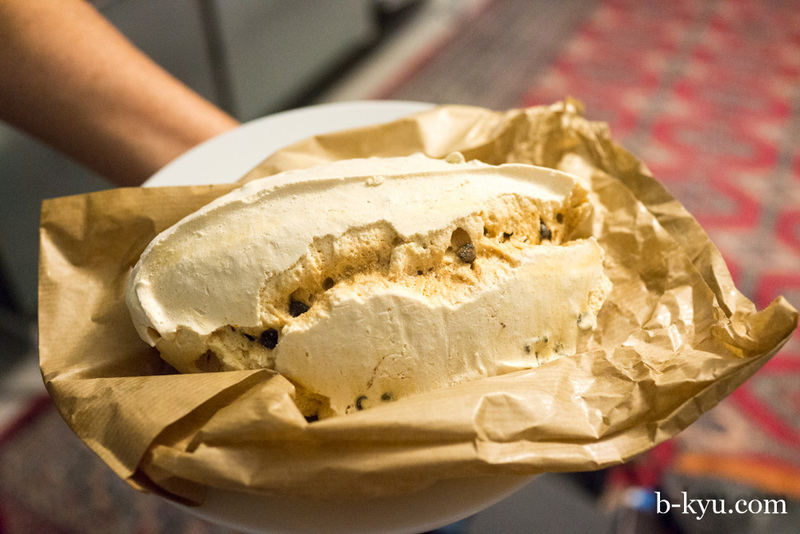 Large meringue with bits of chocolate, forget your piddly little macarons. Although we didn't try these tomato farci (stuffed tomatoes), they have become an obsession for us and we've sought them out in Paris and Noumea at every opportunity. We're not sure why, we just love them. 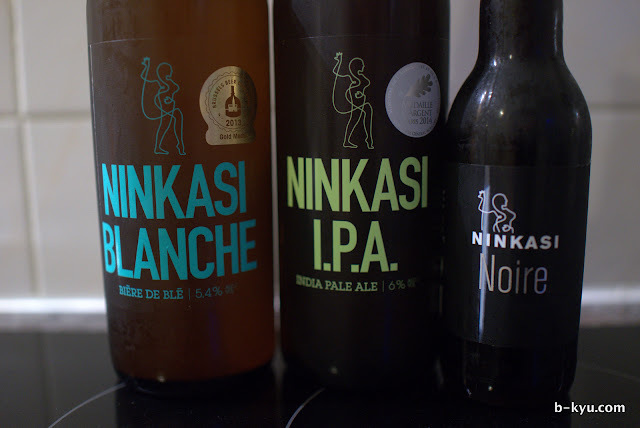 We finished off our stay with some local Lyon brewed beer Ninkasi, white, IPA and dark. 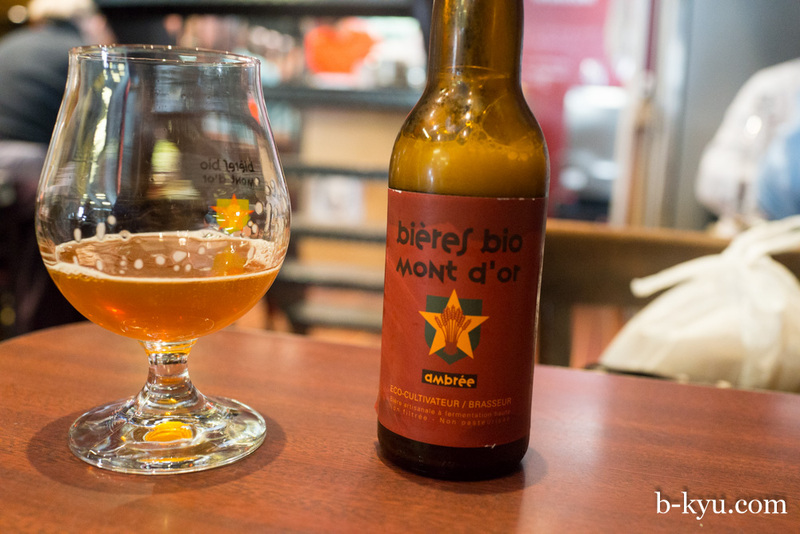 While we were there a brewpub was under construction, opened now complete with music, burgers and this beer. Wow what a trip! Would love to get back to Italy as well as more of France. Our Paris adventures are mostly centred around the less traditional French foods, so hopefully you'll enjoy those. Jealous! 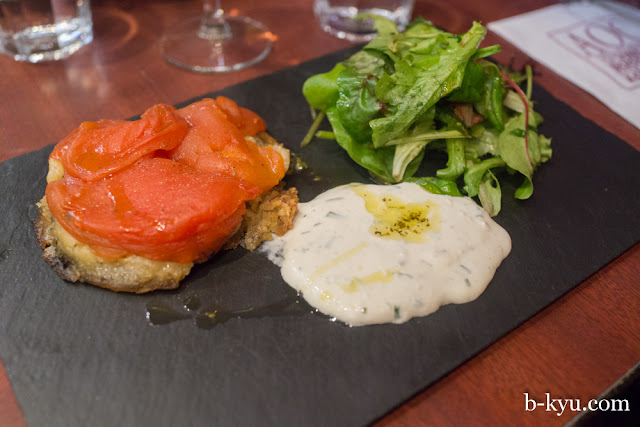 I was in Lyon for a couple of days and didn't have enough time to try all the food I wanted. 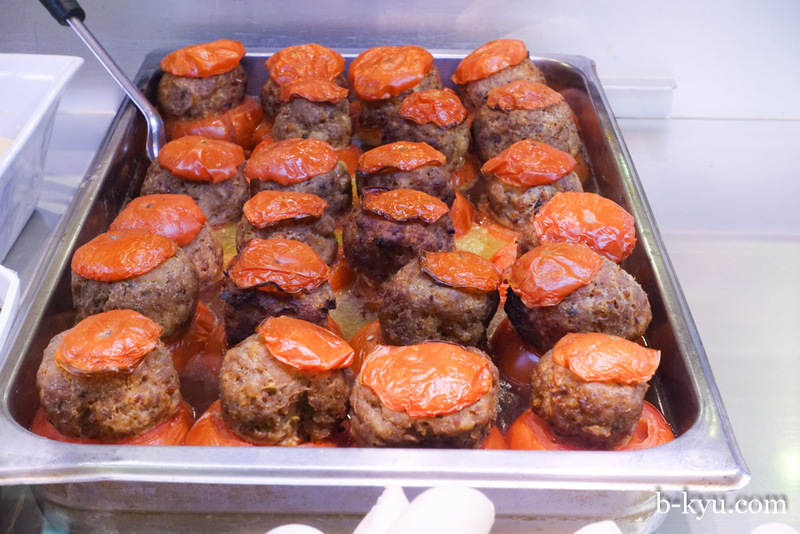 The stuffed tomatoes look great! 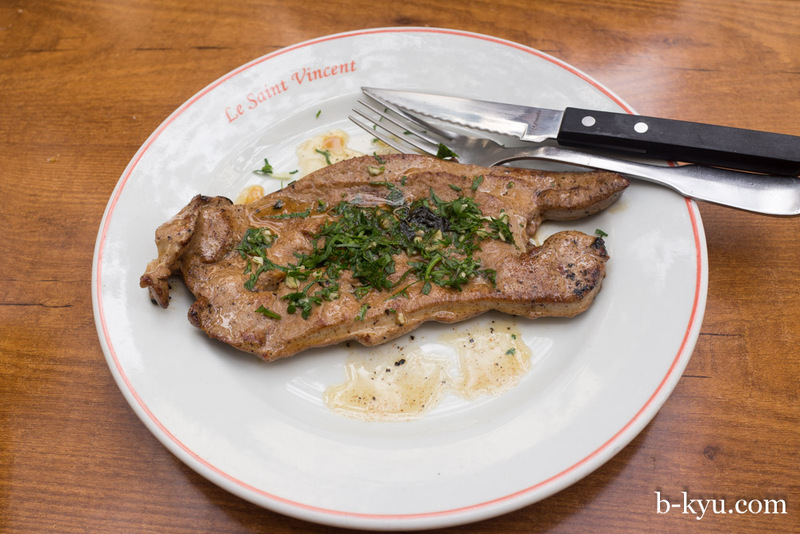 Isn't foie de veau veal liver though, not pork? Or had they run out of the veal kind?